Two of the most prolific offenses in college football's still-young season resorted to trading defensive punches Saturday night in Oxford. Not until Jaylen Walton dashed 23 yards for a touchdown midway through the fourth quarter did the 10th-ranked Ole Miss Rebels take control of a game long anticipated by two fan bases. Tiger quarterback Paxton Lynch fumbled as he was sacked on the previous play from scrimmage, the most costly of two Memphis turnovers on the night. When Rebel quarterback Bo Wallace connected with LaQuon Treadwell for a 63-yard touchdown pass three minutes after the opening kickoff, the game appeared headed in the direction typical of recent Tiger clashes with members of the SEC. But the only other points scored before the fourth quarter would be on a 40-yard field goal by Memphis kicker Jake Elliott with 2:51 left in the first period. Ole Miss turned the ball over four times (Memphis cornerback Bobby McCain grabbed the 9th and 10th interceptions of his college career), had a 71-yard touchdown run nullified by a holding penalty, and saw two field-goal attempts by Andrew Fletcher miss the mark. But the Rebels' stellar defense held the Tigers to 103 yards of offense and forced 10 punts to secure the program's first 4-0 start since 1970. The victory is the sixth straight for Ole Miss over Memphis, though the programs hadn't faced each other since 2009. The Rebels had 27 first downs compared with only 13 for Memphis. The individual numbers for Memphis were the ugliest they've been this season. Lynch completed only 13 of 31 passes for 81 yards and an interception (on a ball juggled by Tiger receiver Joe Craig). 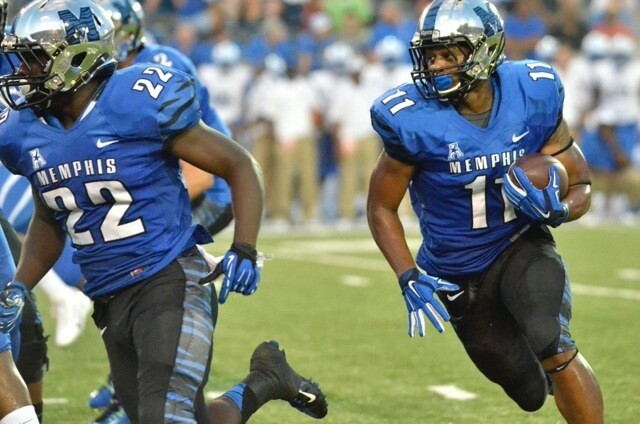 Freshman Jarvis Cooper led the Tiger ground attack with merely 29 yards on seven carries. Wallace connected on 22 of 37 passes (250 yards) for the Rebels, including a pair of touchdown tosses (another 17-yarder to Treadwell late in the fourth quarter after the game had been decided). Walton rushed for 78 yards on 10 carries. The loss is the 26th in 28 games against SEC competition since the Tigers upset Tennessee in November 1996. Memphis falls to 2-2 and will open American Athletic Conference play next Saturday at Cincinnati. • In the world of sports marketing, it’s better to be lucky than good. 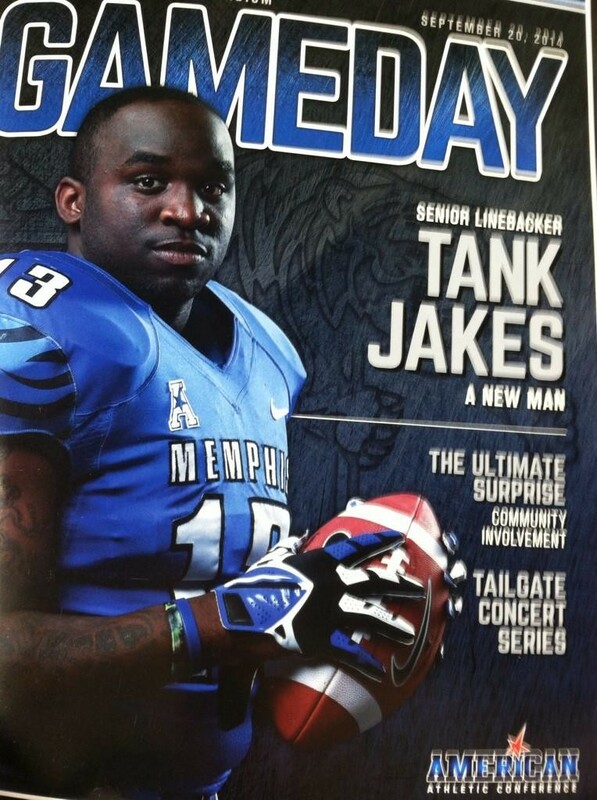 Saturday night at the Liberty Bowl, more than 46,000 football fans had a chance to thumb through the University of Memphis Gameday magazine, senior linebacker Tank Jakes gripping a football on the cover. How brilliant the magazine’s editors appeared by game’s end. Starting for just the fifth time in his college career, Jakes performed like an undersized Ray Lewis in leading Memphis to an easy win over Middle Tennessee: two sacks (one for a safety), a forced fumble (that led to a Bobby McCain touchdown), and a fourth-quarter interception (the second of his career) that sealed the victory. On Monday, Jakes was named the (quite obvious) American Athletic Conference Defensive Player of the Week. Tiger coach Justin Fuente described Jakes as “heady” during his postgame press conference, acknowledging the smarts that contribute to the kind of impact Jakes makes on a football game. Jakes himself described the “edge” with which he plays, always being the “smallest player on the field.” If you’re looking for the personification of the current Memphis program — relatively small but full of fight and vigor — you need look no further than number 13 in your game program. That guy on the cover. • They’ve come to be called “stretch games.” A small (or struggling) program schedules a team from one of the “power five” conferences, in part to measure progress in the weaker program, often to reap the benefits of larger-than-normal attendance. 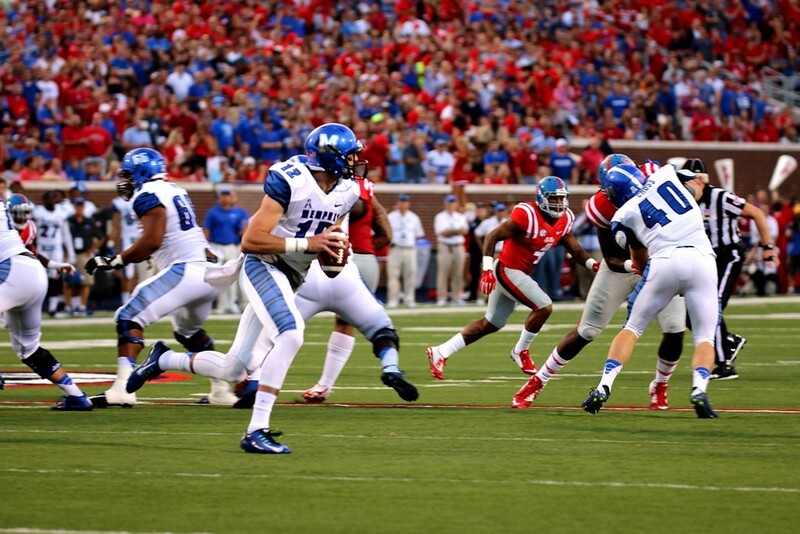 This week’s tilt at 10th-ranked Ole Miss is a “stretch game,” to say the least, for the University of Memphis. It’s actually the Tigers’ second such game this month (see UCLA, September 6th). I’ve been outspoken against the Tigers playing SEC foes. Since Memphis beat Tennessee in 1996, the Tigers have played 27 games against teams from the country’s best conference . . . and lost 25 of those games. There have been some big crowds at the Liberty Bowl to see UT, Mississippi State, or Ole Miss bludgeon the home team, but beyond the turnstile count, I can’t see the benefit for the Memphis program. Each of these games is a three-hour sampling for elite recruits to see just how wide the gap is between the U of M and the SEC. They are the polar opposite of promoting a program. All that said, Saturday is going to be fun. Memphis and Ole Miss have played 59 times and some of the Tigers’ most celebrated wins came at the expense of the Rebels. In 2003, Memphis beat Eli Manning and friends on national television, one of the Tigers’ two SEC wins over the last 17 years. (The other came the next season in Oxford.) Fuente seems to agree with me on the matter of scheduling this kind of “stretch game.” Before the season opened, he told me there would be one per season on future schedules and insisted he has no “inferiority complex” with the SEC. So enjoy Saturday’s game. Just don’t get used to it. • In measuring both offense (480 yards) and defense (nine tackles for loss, three forced turnovers), Saturday’s win was the Tigers’ most complete since Fuente arrived before the 2012 season. But you get the sense we’re still at the beginning, the embryonic stage for a program with higher aspirations. After the victory Saturday night, I asked the Memphis coach what could be improved for this week’s game at Ole Miss. Fuente grinned slightly, shook his head, then delivered the following: “We threw an interception on third-and-long; we gave up a couple of pressures offensively; we didn’t score enough in the red zone; when we had a sudden change, we didn’t respond defensively. Those are the things that stick out in my mind, off the top of my head.” The most dangerous threat to a growing program is satisfaction. Don’t think Justin Fuente and his staff are satisfied with the Tigers’ 2-1 start. And be glad they’re not. It's one thing to go by the name Tank and quite another to play like one. Tiger senior linebacker Tank Jakes — at 5'11" and 227 pounds, there's some irony to the name — played the kind of game that can be packaged and delivered to NFL scouts as his own personal highlight reel. Jakes had six solo tackles, two sacks (one for a safety), a forced fumble, and an interception to all but seal the Tigers' second victory of the season. Playing in front of 46,378 fans (the Tigers' largest home crowd since 2006) Memphis displayed the same balanced offensive attack that hammered Austin Peay and almost upset UCLA. "It was a great atmosphere," said Jakes. "My adrenaline was pumping. I play with an edge. I'm the smallest guy on the field at all times; people want to intimidate you. So I play with an edge. We had an extra week to prepare [for today's game], so we came out and did what we had to do." Memphis ran 86 plays and piled up 480 yards in easily handling the Blue Raiders, a team that had won five of six meetings since the programs resumed playing in 2007. A Middle Tennessee offense that entered the game averaging 501 yards per contest was force to punt on four of its first six possessions, another of those possessions ending when Jakes sacked Blue Raider quarterback Austin Grammer in the end zone to give the Tigers a 9-0 lead in the first quarter. "We had a great crowd, an active crowd," said Tiger coach Justin Fuente. "We had a crowd that wanted to help us win the football game. They helped us win. I'm awfully appreciative of that. We challenged [the team] to play with more discipline, and we did that. It certainly wasn't a perfect performance. But we were able to run the ball, make some plays with the passing game, and we played pretty darn good defense." Fans weren't yet entirely through the gates when tight end Alan Cross caught a seven-yard pass from Tiger quarterback Paxton Lynch to give Memphis a 7-0 lead 3:19 into the game. Jake Elliott's first field goal of the season and a 32-yard touchdown run by Doroland Dorceus extended the lead to 19-7 by halftime and gave the Tigers all the points they'd need. Senior cornerback Bobby McCain picked up a Grammer fumble and sprinted 59 yards for a touchdown (the fourth of McCain's career) with 11:13 left to play in the game. The fumble was caused by Jakes, who then picked off a Grammer pass on the Blue Raiders' next possession. Dorceus, Brandon Hayes, and Sam Craft combined to rush for 242 yards on 42 carries. Keiwone Malone caught six passes for 76 yards, and Cross added a 50-yard catch-and-run touchdown early in the fourth quarter to help pad Lynch's numbers for the game (21 of 35 for 219 yards and two touchdowns). The Tigers did not allow a sack, while the Memphis defense took Grammer down five times. "Each week is a new challenge," said Fuente. "I think we accounted for ourselves well tonight. But it's a long season, and we have to keep getting better." On the subject of the game's standout performance: "[Tank Jakes] is a good football player. He understands the game. He's very heady. He can get into cracks and crevices to make plays." Fuente acknowledged his defense virtually shutting down Middle Tennessee's running game (88 yards on 34 carries), forcing a one-dimensional attack that the faster, gap-closing Tigers were able to nullify. "We were able to get some pressure when bringing just three guys," he said. "We can mix up some looks on teams if there's one part of the game you don't have to worry about as much." The crowd was the eighth-largest the Tigers have hosted when playing a team not from the mighty SEC. "Our administration has done a fantastic job of making things accessible," said Fuente, "and attracting people. The crowd played a big role on third down. We're taking a step toward making this a tough place to play." Memphis is assured of entering October with a .500 record for the first time since 2004. Now 2-1, the Tigers travel to Oxford next Saturday to take on 10th-ranked Ole Miss. The two programs haven't met since 2009, but Ole Miss has won the last five meetings and nine of the last eleven. 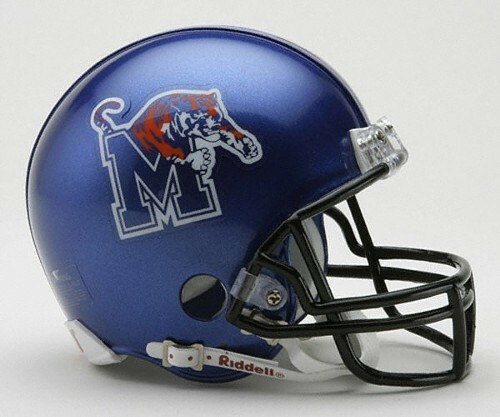 A new era in Memphis Tiger football has arrived. Sixty-three points against an FCS weakling is one thing. Traveling two time zones away and putting up 35 points against the 11th-ranked team in the country is something unlike local football fans have seen in years. Not until the final play of the game did UCLA secure a win tonight at the Rose Bowl in Pasadena, California. Bruin quarterback Brett Hundley — the subject of early-season Heisman Trophy chatter — completed 33 of 44 passes for 396 yards and three touchdowns, just enough to prevent the biggest Tiger upset in almost 20 years. UCLA scored touchdowns on four consecutive possessions in the first half to take a 28-14 lead, but the Tigers responded one series after another. An 18-yard run by Brandon Hayes with just over three minutes left in the second quarter closed the deficit to seven points (28-21). The Tiger offense accumulated 310 yards in the first half, more than it did in six entire games during the 2013 season. The Bruins extended their lead to 35-21 on a Myles Jack four-yard run with 4:51 to play in the third quarter. But Memphis scored two touchdowns in the first two minutes of the fourth quarter to tie the game. Sophomore tailback Doroland Dorceus ran 40 yards to the end zone, then senior safety Fritz Etienne picked off a Hundley pass and returned it 17 yards for a touchdown. A 33-yard pass from Hundley to Thomas Duarte put UCLA back on top, 42-35, with 10:52 to play and proved to be the final scoring play of the game. The Tigers' last four possessions ended with three punts and the expiration of the game clock. Playing without injured defensive end Martin Ifedi, the Tiger defense allowed 540 yards and an average of 6.1 yards per play. 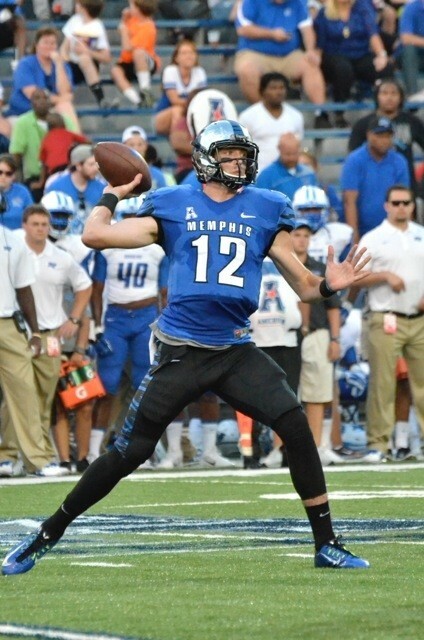 Led by sophomore quarterback Paxton Lynch (27 of 41 for 305 yards), the Tigers gained 465 yards, more than all but one game from the 2013 season. It would seem the metaphorical bar has finally been raised for the long dormant Memphis offense. Dorceus ran for 86 yards on 13 carries and no fewer than 10 Tigers caught passes for positive yardage. The Tigers will have two weeks to review what went right (on offense) and wrong (on defense) against UCLA before hosting Middle Tennessee on September 20th at the Liberty Bowl. Having put up 98 points in its first two games, the Memphis offense will seek to further establish the redefinition of Tiger football. The Blue Raiders, it should be noted, have won five of the teams' last six meetings, including the last three. 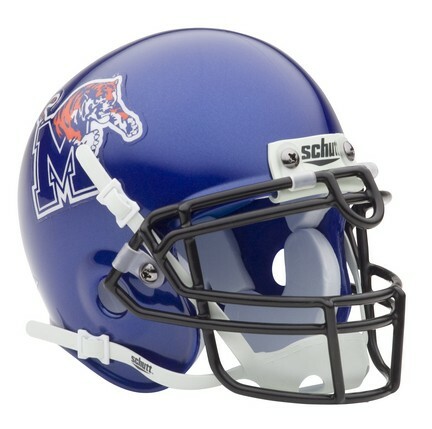 • The Tiger football program is not exactly known for upsets. It’s been almost 18 years since Memphis last beat a ranked opponent. (Raise your hand if you remember the upset of 6th-ranked Tennessee on November 9, 1996.) Over the last quarter-century, Memphis has won exactly three games against Top-25 opposition. (They also beat 16th-ranked USC in 1991 and 23rd-ranked Mississippi State to open the 1993 season.) To be fair, the Tigers have gone entire seasons — most recently 2012 — without playing a ranked team. But what kind of chance do the Tigers have Saturday night in the Rose Bowl against 11th-ranked UCLA? Most betting lines have the Bruins favored by three touchdowns. The Tigers have won only two road games since Justin Fuente became head coach, and only three road games — total — since the start of the 2009 season. All of which, if you ask me, makes a delightful setting for an upset around midnight central time Saturday night. UCLA quarterback Brett Hundley may win the Heisman Trophy and the Bruins may claim L.A. as their own with the recent turnover at Southern Cal. But the Tigers held serve (mightily) in their opener against Austin Peay, and have been looking forward to this trip an entire off-season. I’d be foolish to pick the Tigers to win, but I don’t think Paxton Lynch, Charles Harris and friends will be intimidated by the ranking their foe brings this weekend. • The only white-knuckle moment for Tiger fans Saturday night came midway through the third quarter when senior defensive end Martin Ifedi was helped off the field, having apparently injured an ankle. (The Tiger staff and administration remain hush-hush on the severity of the injury, or whether or not Ifedi will play against UCLA.) Memphis was leading 49-0 at the time, which led to some easy second-guessing on the wisdom of having a star like Ifedi on the field. I have no problem with Ifedi playing, regardless of the score. He’s a football player, a defensive lineman no less. Trying to measure the probability of a lineman injuring himself on any snap of the football is like trying to dodge raindrops in a late-summer Mid-South thunderstorm. The Austin Peay game was the 37th of Ifedi’s college career (he has not missed a game for the Tigers). Needless to say, he’s been on the field when the score was the inverse of the one Memphis fans relished last Saturday. He’s earned the right to be on the field with his team comfortably ahead.